Temporary itching can occur on the skin between the fingers without any apparent reason. This temporary itch subsides on its own and is usually does not warrant medical attention. Sometimes, however, the itch may be persistent, and can be accompanied by a rash. This requires proper diagnosis by a medical professional and the appropriate treatment is then prescribed. Itching on the skin between the fingers can result from various causes. Sometimes, the cause is unknown. The main causes of itching between the fingers are discussed below. Skin irritation is caused by inflammation of the skin upon contact with certain chemical irritants. Rash is a common accompanying feature of the itch caused by exposure to environmental irritants. Medically, this condition is known as contact dermatitis. This is not an allergic reaction, but is caused by tissue damage. The irritant substances could be strong and may do the damage with only a short exposure. Chlorine is one such substance. In other cases, skin irritation only happens after prolonged exposure to the irritant. Water and sweat fall in this category of long-exposure irritants. Prolonged exposure to soaps and detergents also causes a type of irritant contact dermatitis known as “dishpan hands”. The name comes from the observation that this type of skin irritation is an occupational hazard for dish washers, who have repeated and prolonged exposure to dishwashing soaps and water. Allergies are inappropriate immune reactions by our body to certain substances that are normally harmless. Skin allergies can result in inflammation and itching between the fingers. Medically, this condition is known as allergic contact dermatitis. It occurs when the skin comes in contact with an allergen that a person is hypersensitive to. Atopic dermatitis is another type of allergic condition that can lead to itching in the skin folds. In atopic dermatitis (also known as eczema), the allergen need not touch the skin, but may enter the body through inhalation or ingestion. Young children are most commonly affected by this type of dermatitis. Hand infections by various bacteria and fungi are common causes of itching between the fingers. Mostly, these are caused by the overgrowth of normal skin flora under certain conditions, such as a weakened immune system or a break in the skin barrier. A rash is a common occurrence in this type of itch. Bacterial infections of the skin can be either superficial (erysipelas) or deep (cellulitis). Hair follicles may also get infected (folliculitis). gal skin infections are mostly due to dermatophytes that live on the human skin. Since the skin folds between the fingers are warm and moist, they provide ideal conditions for fungal growth. Medically, fungal infection in this region is known as tinea manuum. Apart from dermatophytes, yeasts could also cause skin infections when the skin gets eroded (intertrigo). Scabies is a contagious skin rash caused by mites. The symptoms appear a few weeks after the mite burrows into the skin. The itchiness is caused by an allergic reaction to the mites. These mites are often found to live between the fingers and on the wrists. Read more on hand fungus. Neurodermatitis: The primary symptom of neurodermatitis is itching. Scratching the itchy area of the skin worsens it. The exact cause of neurodermatitis is not known. 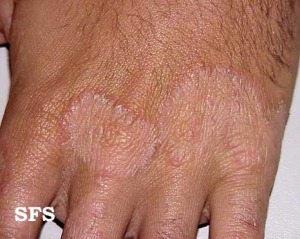 Dyshidrotic eczema: This type of eczema is characterized by appearance of itchy blisters on the skin of feet and hands. The exact cause is not known. The treatment of choice for itching between the fingers depends on the cause. Dry skin: Treatment for dry skin includes reducing the use of antibacterial soaps and hand sanitizers that lead to excessive dryness. These can be replaced by soaps that have a milder action and do not dry out the skin. Using skin moisturizers also helps prevent itching caused by dry skin. Skin irritation: In case of skin irritation between fingers, one should wash hands with soap to remove contact with the irritant. In case of inflammation/rash, corticosteroids may help. Using appropriate gloves can reduce the chances of contact with the irritant. Hand allergies: To control allergic reactions after exposure to allergen, antihistamines can be used. Corticosteroids may be used to combat inflammation. Contact with allergen should be prevented, either by avoiding it or by using gloves and masks while handling it. Skin infections: Appropriate anti-bacterial and anti-fungal medications are used to treat skin infections between the fingers. Mostly, these are topical applications. Oral medications are used only in case of severe infections that are widespread across the body. Preventive measures include keeping the web area between fingers dry and clean. Scabies: Since scabies is contagious, mite infestation in scabies needs to be managed by treating the entire household. The itchiness is treated with antihistamines and anti-inflammatory medications. Medications to eradicate scabies are available (permethrin, ivermectin). Neurodermatitis: Treatment of neurodermatitis is focused on controlling the itching and scratching of the affected skin. Anti-inflammatory medications, corticosteroid injections and psychotherapy are used to treat this condition. Dyshidrotic eczema: Medications used to treat this condition include antihistamines and corticosteroids.